This is the first post in a series where I show you the seasonal wild, free foods that I feed to my rabbit herd. It’s good for them and cheap for me, so it makes us all happy! Purple dead nettle, also known as purple archangel or Lamium purpureum, is a herbaceous flowering member of the mint family common to North America, Europe and Asia. It’s edible to humans both cooked and raw and contains vitamins C, iron and fiber as well as flavonoids and minerals. It’s known in the herbal world as an astringent, diuretic, diaphoretic and purgative. It’s also anti-inflammatory, anti-bacterial, and anti-fungal. The leaves can be used on external wounds or cuts, or as a poultice. I have a whole field of this stuff popping up this spring, and the bunnies are loving it. I’ve been giving them all a great big handful each day and it disappears fast. Maybe your bunny would enjoy it too? I sure wish I had known more about healing herbs and plants when I was growing up, it sure would have saved me a lot of money, time and hassle. After trying more and more natural cures, I don’t understand how certain commercial products can be so popular. So many of them just don’t work. There are things that do work though, and they work very well. They are also cheap and may already be lurking in your spice cabinet. I recently learned about turmeric while I was researching ways to heal my broken foot faster. Turmeric has many healing properties, but my current favorite uses are for acne and for wounds. Not just human wounds, but poultry and livestock wounds as well. 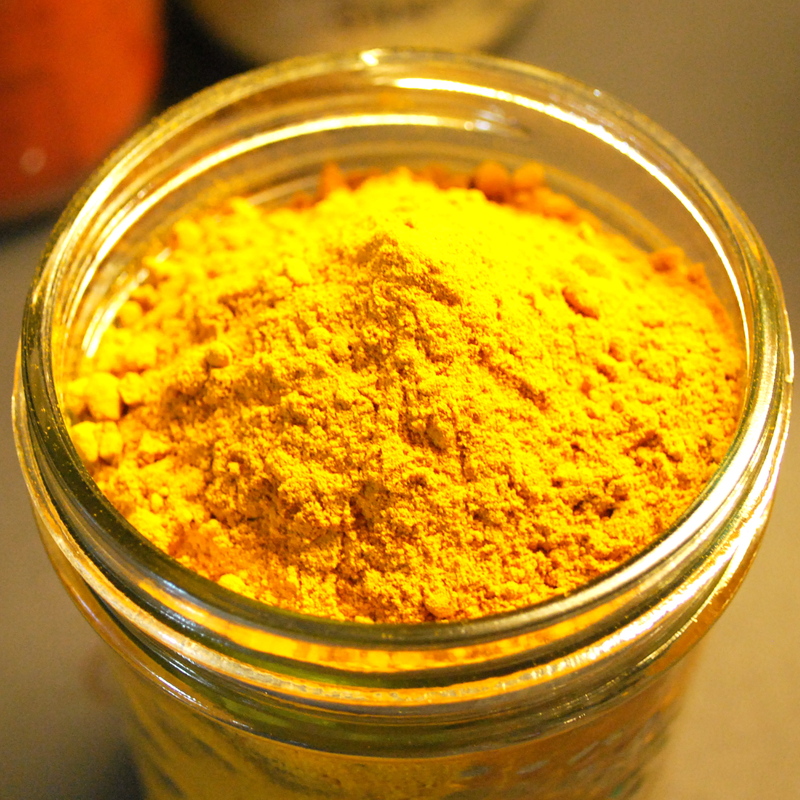 I already had a little turmeric in the pantry for use in making curries. Recently at the Superstore I saw them selling it in kilo bags. Really? Who needs that much turmeric? Well, if they’re selling it someone must be buying it. It was cheap. I had been reading about its many uses. I bought a package and brought it home. It turns out I needed it almost right away. I have three young Muscovy ducks that are in the process of growing up to become new breeders. I had them separated from the main coop but decided to try to integrate them since they were getting pretty big. It turns out the chickens decided that it would be fun (and tasty) to peck out the pinfeathers coming in on their tails. After just one day all three ducks had big, bloody holes in their tails and it was obvious they needed to be separated again. The wounds looked very nasty and I didn’t want them to continue to pick at each other after they were separated, so I made a quick, runny paste with olive pomace oil and turmeric and slopped it all over their tails. I had read it worked well for open wounds. The ducklings all calmed down immediately like they felt relief from the pain. The next day, the wounds looked amazing. They were not red or angry and they looked like they had dried out and closed up almost completely. The color seemed to discourage any more picking. Turmeric and oil is now my go-to remedy for any poultry wounds. It’s amazing. My second favorite use is for acne. I suffered a lot from acne as a kid and eventually had to go on Accutane to calm it down. I still get a few zits on my face now and then, usually right before my period. Generally they are of the blackhead/whitehead, raging red and angry type that I can’t leave alone because they look gross and hurt. Despite better judgement I usually try to squeeze these things to relieve the pain and of course this usually makes them worse. They weep and will sometimes resist healing, forming a new zit in the same spot. Until now I used my favorite (pre-turmeric) remedy, Polysporin; which works well for a lot of stuff but somehow not for zits. I think by keeping the area moist it’s counterproductive. Well, the cure my friends is turmeric. Make a paste of water and turmeric and put it right on your zit. You will feel a warming sensation and any pain will instantly recede. If you have popped a zit and it is weeping, dot some dry turmeric on the spot. It will stop the weeping and calm down the redness and pain. You will be left with a small, dried-out spot that will heal very quickly. The only side effect is your fingertips and sink/washcloth may stain yellow. It will stain your face a little as well, but I’ve found this not to be noticeable enough to care about. Seriously, if you have acne problems, you need to try turmeric. It will change your life. When you break your foot, you suddenly have a lot of time. Therefore I’m going to chronicle what has happened to me so far. I know I’ve been Googling broken feet up the wazoo so maybe this will prove helpful to someone else in search of information. Stepped backwards with my left foot into a one foot deep hole while gardening, about 3pm. Felt a very sharp pain and saw a blinding light. Crawled back indoors, removed shoe and sock and checked out how much I have to pay if I call an ambulance. Too much. No fun ambulance ride. Took some Ibuprofen, called boyfriend and then took a cab to the emergency room. Only way to get around was hopping on my good leg. Was given ice, X-rayed and told I had fractured my fourth metatarsal but bones were aligned well. Given one Dilaudid and a prescription for 20 more. Told to go home, wait for swelling to go down and purchase a walking cast and crutches. Took cab home. Picked up a pair of crutches and filled prescription at pharmacy quickly before Dilaudid kicked in. Came home and was pleased with increased mobility on crutches. Completed minimum required farm chores, albeit very slowly and with difficulty. Mostly had to hop in order to carry food and water dishes. Iced foot for about one hour and kept it elevated. It was not particularly painful but that could have been the drugs. Packed it with a fresh comfrey leaf poultice which was left on overnight. Began taking one cod liver oil capsule per day as well as a dozen raw quail eggs. Also started up a daily, 20 minute oil pulling routine. Sleeping was uncomfortable and my foot kept twitching and waking me up with pain. The worst day. Totally exhausted. Could barely lift myself out of bed with my good leg and arms and upper body in extreme pain from using crutches. Broken foot not painful but beginning to swell. Still have not put weight on it, but it will bear the weight of my resting leg without discomfort. Washed off comfrey poultice and carefully exfoliated foot. Iced for 1 hour. Did practically nothing all day but sit with foot elevated. Took another Dilaudid and some Ibuprofen during the day which helped with overall body pain. Could not complete any farm chores and needed to enlist help. Could barely crutch anywhere as the underarm pain was too severe and good leg was too tired. Applied another comfrey poultice which was left on overnight. Sleeping was ok. Washed off poultice and exfoliated foot. With help, was taken to health food store and purchased alfalfa pills as well as a bone supplement which contains protein and a lot of vitamins and minerals, including horsetail, boron, vitamin K, curcumin, zinc, calcium, phosphorus and vitamin D. Began taking both every day. Still very sore and tired but foot does not hurt. It has swelled up to twice its normal size and is beginning to turn blue. It still hurts too much to crutch very far, it chafes and my arms are tired. Stopped taking any Dilaudid or Ibuprofen as there was no pain anymore from the foot. Also purchased a walking cast or aircast. Made my foot feel a lot more safe from accidental bumps and allowed me to more easily place it on the ground which made crutching about 20% easier. Still not putting any weight on the foot. Eating mostly vegetables and protein and not much else. Not too different from my usual diet. Drinking lots of water. Getting kind of depressed. Still cannot do much but body pain is subsiding slowly. I am already much stronger. Foot is very bruised but aircast is keeping swelling down. Crutching is still not fun due to chafing and I prefer to rest. Luckily I have help on this day and do not have to do chores. Another day similar to day four. The bruising is very evident. I do not do much all day but rest and I do not have any help. Once evening comes around I find I can walk ever so slightly on the aircast if I put most of my weight on the heel. I am overjoyed. I gingerly complete my farm chores in twice the normal time (two hours) but I’m very happy and there is minimal foot pain, more of an aching that slowly gets worse as I walk on it. Later that night there is more achiness. I apply another fresh comfrey poultice and rest. Washed off poultice and exfoliated foot. Foot is still a bit achy and I am reluctant to walk on it, but I can. Depression has lifted as I now know that I can complete chores around the house by myself, even if it’s very slow. Soaked foot in hot water and Epsom salt bath for 30 minutes. 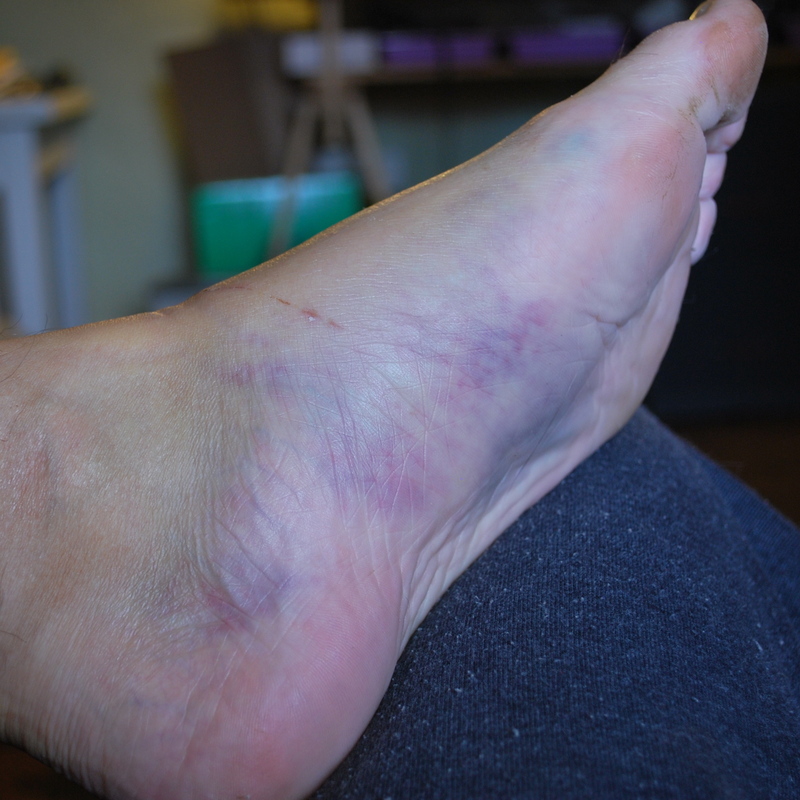 Swelling has reduced slightly but bruising is still evident. Walking definitely hurts, but it’s not a sharp pain, just an ache. Still trying to stay off of it as much as possible. Haven’t attempted farm chores yet today and may take some Ibuprofen to help me get through them. Well it finally happened. After 35 years of never breaking any bones I finally did today. I broke the fourth metatarsal bone in my left foot when I fell into a hole while gardening. A hole I had requested my lovely boyfriend to dig for me just days earlier. Silly me. I remember a blinding flash of light in my brain when it happened, and I just knew I had fractured something. Until now the worst things I’ve ever really had are a sprained ankle or thumb and various concussions. There’s no cast, because the doctor at the hospital said that the bone is aligned properly and broken feet swell too much. I am on crutches though, which seemed kind of fun at first until I tried doing my farm chores. You can’t actually carry anything very well while on crutches. Just doing a few simple things is totally exhausting. I can make do outside with a lot of effort and bit of spillage, but how am I supposed to carry things like plates of food or glasses full of liquid while inside? I’m not really sure. Luckily I know my wonderful boyfriend will help me out as much as he can, but he also lives a two-hour ferry ride away. It will be very interesting to see how well I’ll be able to cope by myself in his absence. I’m very grateful that it was my left foot and not my right, so I can still drive myself around. This was also a fantastic opportunity to try “knitbone”, another name for the comfrey plant. Comfrey contains something called allantoin, which is a cell proliferative. That means it makes cells regenerate faster. Good thing I have my own little patch beside the chicken coop! 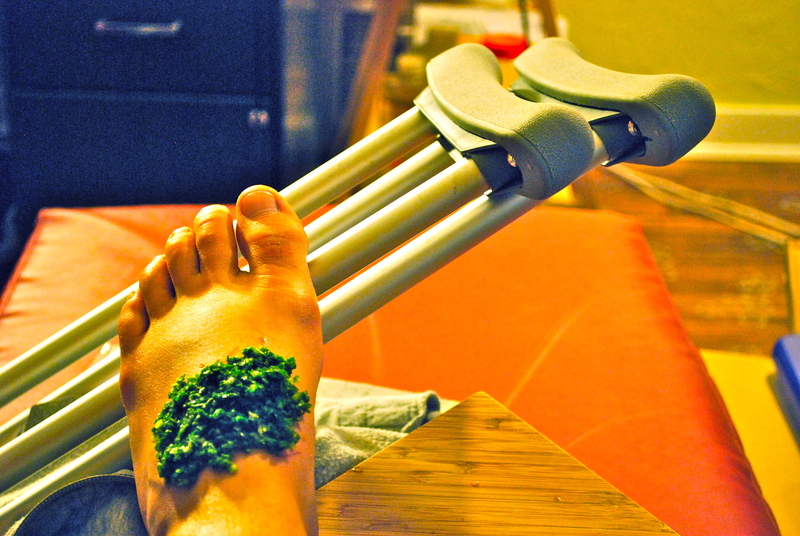 I hobbled down and got myself a nice big fresh leaf, minced it very finely and applied it as a poultice to the affected area. It has a nice cooling sensation and a little bit of a stinging feeling. I hope it helps me heal faster.